This lovely scrub is just one of the many amazing skin scrub’s you can purchase from this fabulous line! They also have lavender, eucalyptus, and vanilla too! Each scrub is 100% Organic and contains natural virgin coconut oil, essential oils, and fine sugar, as well as other high-quality 100% natural ingredients, for a gentle, super moisturizing, yet exfoliating experience, your skin will thank you for! After two weeks of using this scrub a couple times a week, my skin is looking brighter, healthier, and more youthful too! And I can’t believe how soft, smooth, and moisturized it feels coming out of the shower! My skin is so dry that normally I have to run to my lotion after stepping out of the shower because my skin is already drying up and feeling rough and agitated. But when using this scrub in the shower, my skin feels like it’s already been lathered up with an incredibly moisturizing, rich and creamy lotion! This is exactly why I love this product so much and won’t be pushing it to the back of my beauty closet anytime soon- ok, – EVER! Oh no, this baby is staying right in my shower where I can continue to use it for smooth, youthful, super hydrated, glowing skin! 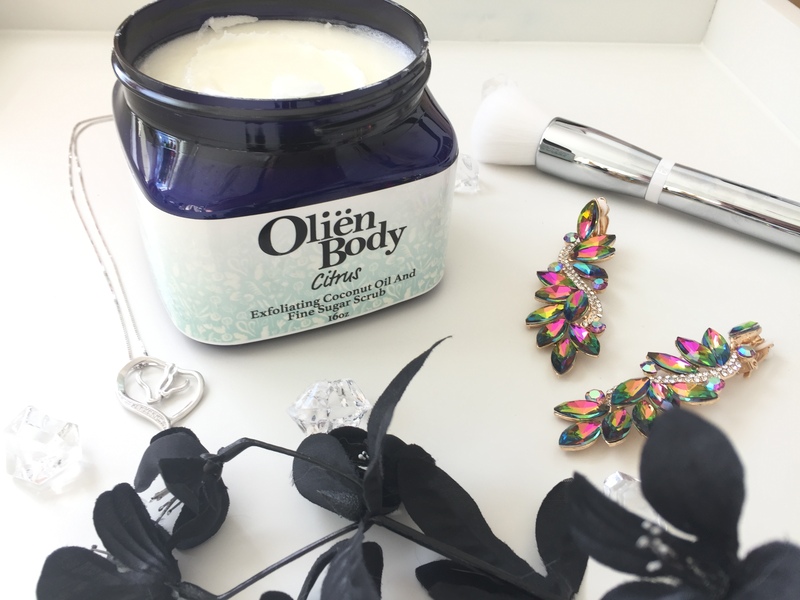 All Oliën Body scrubs are handmade and yet totally affordable too because you can get it right from the source, with no middleman markup! Oliën Body is majority owned by one of the partners at Dr. Squatch, which is the fastest growing high-end men’s soap company in the North America – so you know you’re getting quality, loved products from Oliën Body! What are you waiting for lovelies? Step into smooth, soft, glowing, youthful skin this spring with Oliënbody.com! – Also get FREE SHIPPING on all US orders! Oooh it sounds divine!! I love that they are handmade and have such amazing scent selections!! What a fantastic way to slough off the winter dry skin!! This sounds amazing! I’m not as diligent about applying lotion at night as I was when I was younger, which is silly because I need to do it more now that my skin is aging! Oh, yes! Handmade items are THE best! And the lavender and the vanilla ones sound very calming for the evening , I think for me, the citrus would be better for morning showers because it’s energizing. I love scrubs, they make my skin feel so soft. This one sounds amazing! I love a good sugar scrub, makes me feel pampered.